What Happens to Maine Students Who Don’t Meet Proficiency Standards? Robbie Feinberg reports on proficiency-based education. The state’s new laws requiring proficiency-based diplomas are already affecting the approach to education in many towns across the state. But some districts worry that the new, high standards could leave some students unable to earn a diploma. Two Maine districts are handling the problem by re-imagining what a diploma means. You used to get a high school diploma if you simply passed all your high school courses. But beginning with the class of 2021, Maine students will also need to show proficiency in four areas: English, math, science and social studies. Those standards get progressively higher in the following years, so by 2025, students will need to show proficiency in four more subjects, too. Added up, that’s a high bar. “What about the kids coming up who have been moved along, passed along, because of behavioral issues? Who don’t have the academic stamina to sustain? Who might have language exceptionalities? Students who just learn differently?” says Matt Drewette-Card, curriculum coordinator for AOS 94 in Dexter. After these new laws were passed, Drewette-Card started to worry about these students — the ones who previously were shuffled along from grade to grade. Many districts in the state, including Dexter, have developed support systems to monitor students and keep them on track. But Drewette-Card still wasn’t sure that was enough. After countless late nights of brainstorming, Drewette-Card has now devised a system that he thinks might help these kids. The proposal is still in the early stages, only shared among administrators and some local school board members. But the plan takes apart and re-imagines what a diploma is. 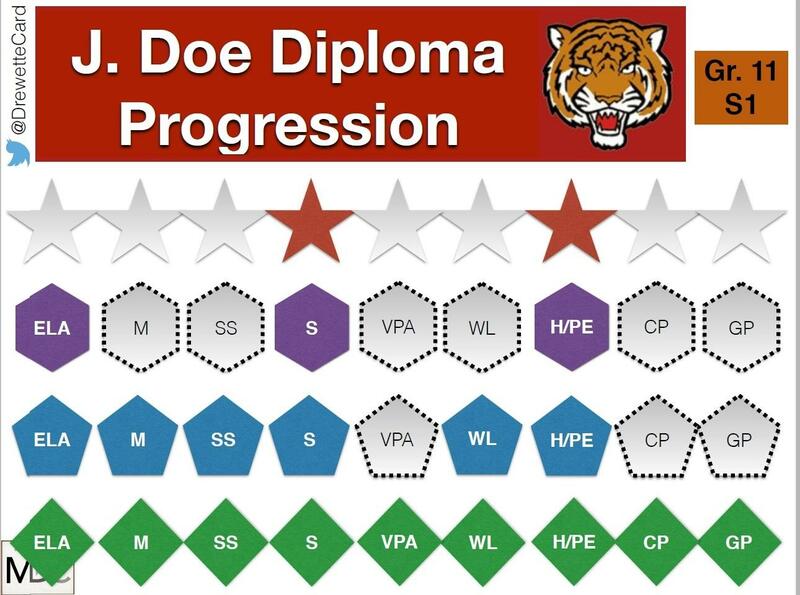 A chart for a diploma, reimagined by Matt Drewette-Card, curriculum coordinator for AOS 94 in Dexter. Drewette-Card takes out his laptop and pulls up a chart with four lines of “badges” running across the screen. He explains that each line represents the requirements for a different kind of diploma in AOS 94. On the bottom sits Level 1, the “basic skills and career ready” certification. Above that is one that’s “community college and career ready.” The third is for a four-year college, and the top one is the “Mastery” diploma, for the student who goes above and beyond. “If you think in terms of a video game, a video game on Level 1 would require you to do a certain number of tasks. Once you complete those tasks, that final boss, you advance to Level 2,” Drewette-Card says. He says it’s the same here. Get past Level 1 English standards, move on to Level 2. You do it for every subject, and you simply try to go as high as you can. “So it’s kind of allowing our students to customize their paths a little more, as well,” he says. For some students, that means getting that 12th-grade diploma. But Drewette-Card says this hopefully helps the other students who might not get that far. “We can say this student has earned a career ready certificate and diploma. Here’s what that means. Here is what that student can do. We can specifically pinpoint — not just give you a transcript that says, “U.S. history: B-minus.” Well, U.S. history is great, but I want to know what a student can do with it,” he says. The issue, though, is the level of proficiency required for each diploma. Drewette-Card says only the third diploma — the four-year-college one — is the only one at the level of complexity for 12th-grade standards. The standards for the first two levels of diploma are less complex — some only at an 8th or 9th grade level. “The evidence has to be evidence of high school proficiency. It can’t be evidence of proficiency lower than high school,” says Diana Doiron, standards-based education specialist with the Maine Department of Education. Doiron couldn’t comment directly on the Dexter proposal, but says the department is in the process of creating its own rules on diplomas. She says the the state’s been clear about its position that for a student to receive a diploma, they must meet high school standards — nothing lower. “We’ve seen some samples over the years where components of the district’s proposals have evidence at the 8th grade level. And that isn’t sufficient evidence for a high school, proficiency-based diploma,” she says. Other districts are eying new strategies, as well. In Bangor, administrators have developed a new system that includes a “certificate of completion” for students who pass every class but not every standard. Superintendent Betsy Webb sees it as a way to keep kids learning after high school, even if they can’t reach every standard. “We want to ensure we take students as high as we can. But we never close down opportunities,” she says. On the business side, Portland Chamber of Commerce CEO Chris Hall says a diploma will always be important for a job. But he doesn’t view it as a be-all, end-all. “I think employers are more interested in the outcome of those elements rather than a piece of paper. Also, transcripts haven’t gone away. If a kid goes through high school, just didn’t take one subject matter out of the 8, the complete learning results, they’re not gonna look away from that individual,” he says. Ultimately, Doiron says she expects the process will be sorted out as the department continues to clarify its rules over the coming months and years. She says it will be messy, but as educators talk to each other and compare plans, she hopes new, effective systems for marking the completion of high school in Maine will emerge.